Antimicrobial test certified by SGS Taiwan Limited. 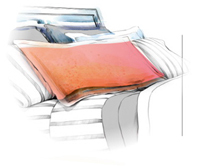 With built-in Microban® protection, the soft comfortable microfiber of our Pillow Cover inhibits the growth of any allergens, provides continuous antimicrobial protection 24/7 and doesn't slip off easily. Our universal Microban antimicrobial certified pillow cover makes sleep comfortable and safe, wherever you put your head. Can be used for in home or while traveling. Keep dry after each use. Care for your pillow cover by drying them after each use. Wash your pillow cover periodically with regular pH neutral detergents. This will help you preserve the life of your pillow cover. Microfibers are almost twice as fast and absorbent as cotton. 1/200th the diameter of a human hair, microfibers can absorb 8 times their own weight in water.